Contractors dig up the front lawn of Edgar P. Harney elementary school in Central City. The school’s bathrooms are out of service while crews repair a dislodged drain line. 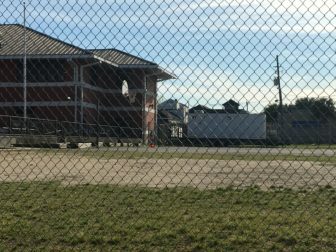 Plumbing contractors were digging up Edgar P. Harney elementary school’s lush front lawn on Willow Street Tuesday afternoon while a portable toilet trailer sat on the school’s blacktop playground along busy Claiborne Avenue. “The bathrooms aren’t working,” one of the workers told The Lens. A clogged sewer line was initially to blame. But when contractors finally got beneath the Central City school they said they discovered a bigger problem — a dislodged drainage pipe. “Now, we have to tunnel in to replace it,” he said from the lawn as another worker was standing in roughly a five-foot deep hole. The repairs may take a few days, she explained in an email. On Wednesday afternoon, workers had just begun digging a second hole under the school. Kishauna Ross’ 14-year-old daughter is in the eighth grade at the 234-student school. She was not pleased with the temporary bathroom trailers because she said the facilities for girls and boys — while they have separate entrances — are housed in the same trailer. A portable toilet trailer sits on the blacktop at Harney elementary school in Central City on April 3, 2019. 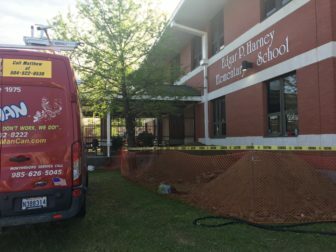 Crews are repairing the school’s drain line and bathrooms are out-of-service while they work to fix a dislodged pipe. Washington said the portable bathrooms have separate entrances and stalls within them, but she didn’t address adult supervision. Ross also said she was not informed of the problem. “I do not like the fact that I didn’t get a letter stating there was a problem with the restrooms at the school,” Ross said on Tuesday. Nor did she receive a phone call, she said, noting the school often robocalls announcements. “I really have an issue with it,” she said. The lack of indoor bathrooms is just one more thing in a long list of challenges for Harney, which is slated to close at the end of the school year, following a district takeover earlier this year. Harney is one of five schools set to close at the end of the year. The former charter school had racked up several violation notices over the last two years. The district cited them for issues ranging from financial problems, failing to serve special education students and improperly withholding tens of thousands of dollars from employees’ retirement funds. In September, the district suspended enrollment at Harney along with three other schools that it said didn’t appear likely to be open past the school year. In November, Superintendent Henderson Lewis Jr. announced that the school would close. Two weeks later, he said he would seek to revoke Harney’s charter mid-year. Soon after that, the Spirit of Excellence charter board voted to surrender its charter. The district said it violated state law and district policy. Despite working for years to rid itself of direct-run schools, the district took over the school for its final five months. Teachers had to reapply for their jobs in December. In January, when students returned after an extra week of winter break, Orleans Parish leadership was in place. Then came an unexpected hurdle for the district — it couldn’t access Harney’s federal funding. After weeks of negotiation, Orleans Parish School Board members agreed to grant a request for about $750,000 from district reserves to ensure teachers got paid and the school could finish the year. The district has given Harney students “priority” status in the city’s enrollment lottery, called OneApp. Results are expected to be announced this month. Meanwhile, Ross said she hopes the bathrooms are repaired quickly and in time for upcoming state testing. Washington told The Lens the repairs should be completed over the weekend and testing will begin next week. This post was updated after publication with information from the Orleans Parish School Board.